M'Neill v. M'Neill & Jollie. Interlocutors Reversed, & Cause remitted, with Directions. M. of Westmeath v. M. of Salisbury et al. Rowe v. The King, Defendant's Petition for a Day for Hearing, &c. referred to Appeal Com ee. Balmer v. Hogarth et al. Respondents Petition to receive their Case, referred to Appeal Com ee. Balmer v. Hogarth, (2d Appeal,) Respondent's Petition to receive his Case, referred to Appeal Com ee. 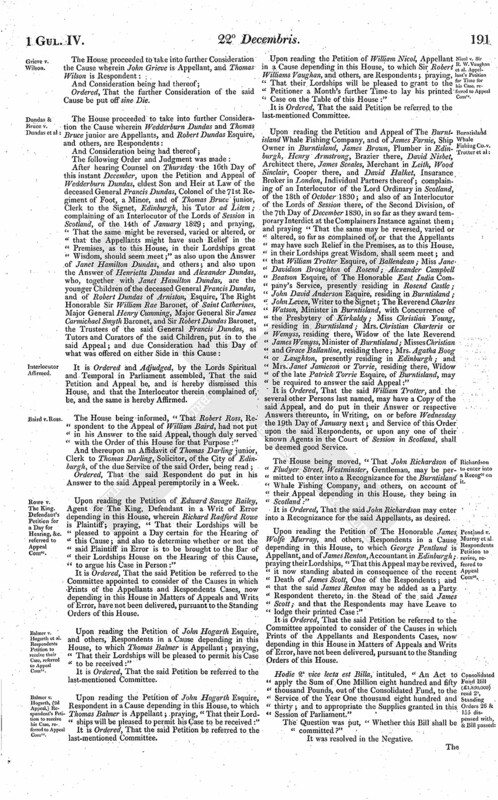 Nicol v. Sir R. W. Vaughan et al. Appellant's Petition for Time for his Case, referred to Appeal Com ee. Richardson to enter into a Recogce on it. Pentland v. Murray et al. Respondents Petition to revive, referred to Appeal Com ee. Criminal Laws, Petition from Stockton for Revision of. Coals carried Coastwise, Petition from Stockton upon Tees for Repeal of Duty on. Slavery, Petitions from Belfast, & West India Planters, &c. for Compensation in event of Abolition of. Proceedings, East India Judicature Act. The Lord Chief Baron sat Speaker by virtue of a former Commission. The Answer of John Hogarth Esquire, late of Hilton, Berwickshire, James Hogarth, Tenant in Eccles Newton, Berwickshire, and George Hogarth, Writer to the Signet, to the Petition and Appeal of Thomas Balmer, was this Day brought in. As was also, The Answer of John Hogarth Esquire, late of Hilton, Berwickshire, James Hogarth, Tenant in Eccles Newton, Berwickshire, and George Hogarth, Writer to the Signet, to the Petition and Appeal of Thomas Balmer. 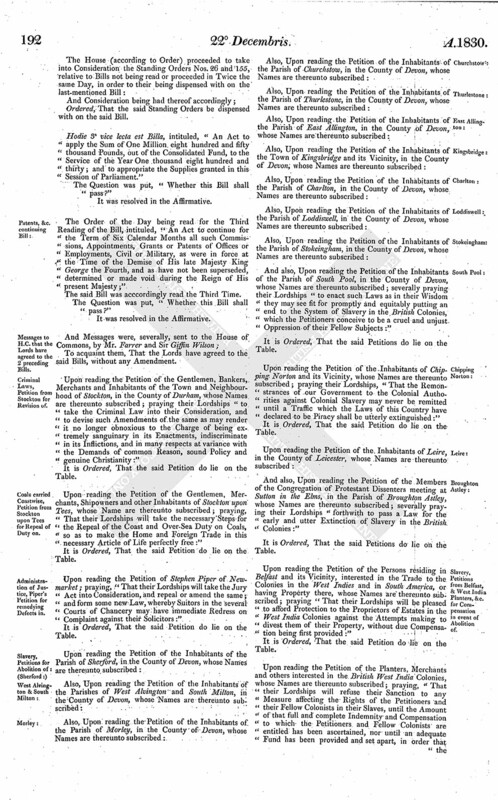 It is Ordered and Adjudged, by the Lords Spiritual and Temporal in Parliament assembled, That the several Interlocutors complained of in the said Appeal, be, and the same are hereby Reversed: And it is further Ordered, That the Cause be remitted back to the Court of Session, to ascertain what is due to the Pursuer on the Heritable Bond, with Simple Interest thereon, to be calculated on the Principal Debt, and to proceed accordingly, without Prejudice to such Claim, if any, as the said Respondents may be enabled to make for any Part of Expences of Process incurred prior to the Date of the Interlocutor of the Lord Ordinary of the 12th and signed 16th November 1825, or to the Objections which the Appellant may be enabled to make against such Claim. It is Ordered, That the further Hearing of the said Cause be put off sine Die. Ordered, That the Cause wherein Mrs. Catharine Munro and Hugh Rose her Husband are Appellants, and Andrew Berkeley Drummond Esquire, and others, are Respondents, be further considered on the first Wednesday after the Recess at Christmas. The Agent for The Marchioness of Westmeath, One of the Respondents, said the Question took him by Surprise, and he had no Authority to consent to any thing. The Agents were directed to withdraw. Then the House proceeded to take the said Cause into further Consideration. Ordered, That the further Consideration of the said Cause be put off to the first Day after the Recess at Christmas. It is Ordered and Adjudged, by the Lords Spiritual and Temporal in Parliament assembled, That the said Petition and Appeal be, and is hereby dismissed this House, and that the Interlocutor therein complained of, be, and the same is hereby Affirmed. The House being informed, "That Robert Ross, Respondent to the Appeal of William Baird, had not put in his Answer to the said Appeal, though duly served with the Order of this House for that Purpose:"
Upon reading the Petition of Edward Savage Bailey, Agent for The King, Defendant in a Writ of Error depending in this House, wherein Richard Radford Rowe is Plaintiff; praying, "That their Lordships will be pleased to appoint a Day certain for the Hearing of this Cause; and also to determine whether or not the said Plaintiff in Error is to be brought to the Bar of their Lordships House on the Hearing of this Cause, to argue his Case in Person:"
Upon reading the Petition of John Hogarth Esquire, and others, Respondents in a Cause depending in this House, to which Thomas Balmer is Appellant; praying, "That their Lordships will be pleased to permit his Case to be received:"
Upon reading the Petition of John Hogarth Esquire, Respondent in a Cause depending in this House, to which Thomas Balmer is Appellant; praying, "That their Lordships will be pleased to permit his Case to be received:"
Upon reading the Petition of William Nicol, Appellant in a Cause depending in this House, to which Sir Robert Williams Vaughan, and others, are Respondents; praying, That their Lordships will be pleased to grant to the Petitioner a Month's further Time to lay his printed Case on the Table of this House:"
Upon reading the Petition and Appeal of The Burntisland Whale Fishing Company, and of James Farnie, Ship Owner in Burntisland, James Brown, Plumber in Edinburgh, Henry Armstrong, Brazier there, David Nisbet, Architect there, James Sceales, Merchant in Leith, Wood Sinclair, Cooper there, and David Halket, Insurance Broker in London, Individual Partners thereof; complaining of an Interlocutor of the Lord Ordinary in Scotland, of the 18th of October 1830; and also of an Interlocutor of the Lords of Session there, of the Second Division, of the 7th Day of December 1830, in so far as they award temporary Interdict at the Complainers Instance against them; and praying "That the same may be reversed, varied or altered, so far as complained of, or that the Appellants may have such Relief in the Premises, as to this House, in their Lordships great Wisdom, shall seem meet; and that William Trotter Esquire, of Ballendean; Miss Jane Davidson Broughton of Rosend; Alexander Campbell Beatson Esquire, of The Honorable East India Company's Service, presently residing in Rosend Castle; John David Anderson Esquire, residing in Burntisland; John Leven, Writer to the Signet; The Reverend Charles Watson, Minister in Burntisland, with Concurrence of the Presbytery of Kirkaldy; Miss Christian Young, residing in Burntisland; Mrs. Christian Charteris or Wemyss, residing there, Widow of the late Reverend James Wemyss, Minister of Burntisland; Misses Christian and Grace Ballantine, residing there; Mrs. Agatha Boog or Laughton, presently residing in Edinburgh; and Mrs. Janet Jamieson or Torrie, residing there, Widow of the late Patrick Torrie Esquire, of Burntisland, may be required to answer the said Appeal:"
It is Ordered, That the said William Trotter, and the several other Persons last named, may have a Copy of the said Appeal, and do put in their Answer or respective Answers thereunto, in Writing, on or before Wednesday the 19th Day of January next; and Service of this Order upon the said Respondents, or upon any one of their known Agents in the Court of Session in Scotland, shall be deemed good Service. The House being moved, "That John Richardson of Fludyer Street, Westminster, Gentleman, may be permitted to enter into a Recognizance for the Burntisland Whale Fishing Company, and others, on account of their Appeal depending in this House, they being in Scotland:"
It is Ordered, That the said John Richardson may enter into a Recognizance for the said Appellants, as desired. 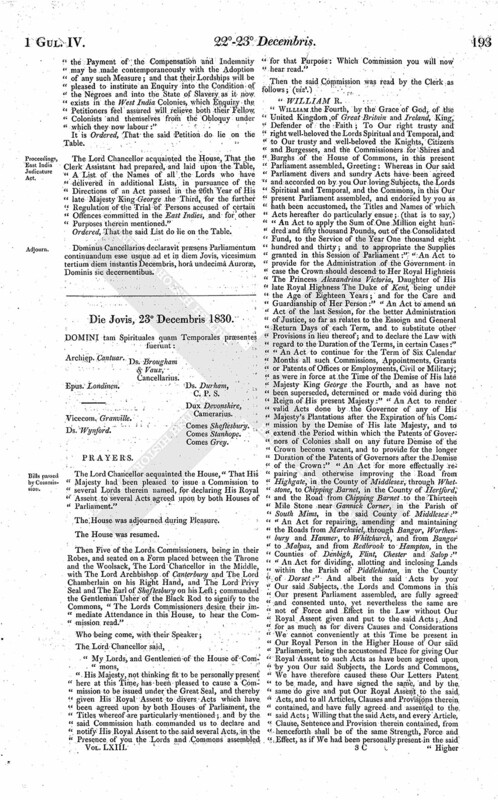 Upon reading the Petition of The Honorable James Wolfe Murray, and others, Respondents in a Cause depending in this House, to which George Pentland is Appellant, and of James Renton, Accountant in Edinburgh; praying their Lordships, "That this Appeal may be revived, it now standing abated in consequence of the recent Death of James Scott, One of the Respondents; and that the said James Renton may be added as a Party Respondent thereto, in the Stead of the said James Scott; and that the Respondents may have Leave to lodge their printed Case:"
Hodie 2a vice lecta est Billa, intituled, "An Act to apply the Sum of One Million eight hundred and fifty thousand Pounds, out of the Consolidated Fund, to the Service of the Year One thousand eight hundred and thirty; and to appropriate the Supplies granted in this Session of Parliament." Hodie 3a vice lecta est Billa, intituled, "An Act to apply the Sum of One Million eight hundred and fifty thousand Pounds, out of the Consolidated Fund, to the Service of the Year One thousand eight hundred and thirty; and to appropriate the Supplies granted in this Session of Parliament." 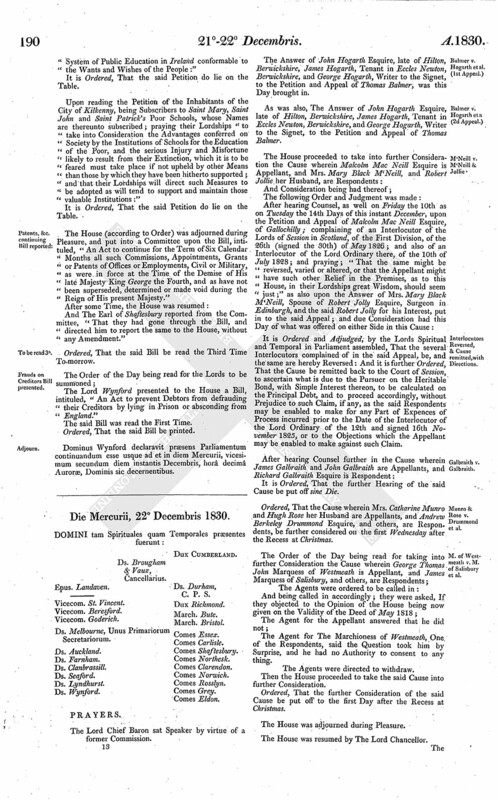 The Order of the Day being read for the Third Reading of the Bill, intituled, "An Act to continue for the Term of Six Calendar Months all such Commissions, Appointments, Grants or Patents of Offices or Employments, Civil or Military, as were in force at the Time of the Demise of His late Majesty King George the Fourth, and as have not been superseded, determined or made void during the Reign of His present Majesty;"
Upon reading the Petition of the Gentlemen, Bankers, Merchants and Inhabitants of the Town and Neighbourhood of Stockton, in the County of Durham, whose Names are thereunto subscribed; praying their Lordships "to take the Criminal Law into their Consideration, and to devise such Amendments of the same as may render it no longer obnoxious to the Charge of being extremely sanguinary in its Enactments, indiscriminate in its Inflictions, and in many respects at variance with the Demands of common Reason, sound Policy and genuine Christianity:"
Upon reading the Petition of the Gentlemen, Merchants, Shipowners and other Inhabitants of Stockton upon Tees, whose Name are thereunto subscribed; praying, "That their Lordships will take the necessary Steps for the Repeal of the Coast and Over-Sea Duty on Coals, so as to make the Home and Foreign Trade in this necessary Article of Life perfectly free:"
And also, Upon reading the Petition of the Inhabitants of the Parish of South Pool, in the County of Devon, whose Names are thereunto subscribed; severally praying their Lordships "to enact such Laws as in their Wisdom they may see fit for promptly and equitably putting an end to the System of Slavery in the British Colonies, which the Petitioners conceive to be a cruel and unjust Oppression of their Fellow Subjects:"
Upon reading the Petition of the Inhabitants of Chipping Norton and its Vicinity, whose Names are thereunto subscribed; praying their Lordships, "That the Remonstrances of our Government to the Colonial Authorities against Colonial Slavery may never be remitted until a Traffic which the Laws of this Country have declared to be Piracy shall be utterly extinguished:"
And also, Upon reading the Petition of the Members of the Congregation of Protestant Dissenters meeting at Sutton in the Elms, in the Parish of Broughton Astley, whose Names are thereunto subscribed; severally praying their Lordships "forthwith to pass a Law for the early and utter Extinction of Slavery in the British Colonies:"
Upon reading the Petition of the Persons residing in Belfast and its Vicinity, interested in the Trade to the Colonies in the West Indies and in South America, or having Property there, whose Names are thereunto subscribed; praying "That their Lordships will be pleased to afford Protection to the Proprietors of Estates in the West India Colonies against the Attempts making to divest them of their Property, without due Compensation being first provided:"
Upon reading the Petition of the Planters, Merchants and others interested in the British West India Colonies, whose Names are thereunto subscribed; praying, "That their Lordships will refuse their Sanction to any Measure affecting the Rights of the Petitioners and their Fellow Colonists in their Slaves, until the Amount of that full and complete Indemnity and Compensation to which the Petitioners and Fellow Colonists are entitled has been ascertained, nor until an adequate Fund has been provided and set apart, in order that the Payment of the Compensation and Indemnity may be made contemporaneously with the Adoption of any such Measure; and that their Lordships will be pleased to institute an Enquiry into the Condition of the Negroes and into the State of Slavery as it now exists in the West India Colonies, which Enquiry the Petitioners feel assured will relieve both their Fellow Colonists and themselves from the Obloquy under which they now labour:"
The Lord Chancellor acquainted the House, That the Clerk Assistant had prepared, and laid upon the Table, A List of the Names of all the Lords who have delivered in additional Lists, in pursuance of the Directions of an Act passed in the 26th Year of His late Majesty King George the Third, for the further Regulation of the Trial of Persons accused of certain Offences committed in the East Indies, and for other Purposes therein mentioned." Dominus Cancellarius declaravit præsens Parliamentum continuandum esse usque ad et in diem Jovis, vicesimum tertium diem instantis Decembris, horâ undecimâ Auroræ, Dominis sic decernentibus.